* Firefox is working to implement input[type=time], but it is currently only supported in the current Firefox BETA, available here: https://www.mozilla.org/en-US/firefox/quantum/. You must download the latest Nightly BETA from Mozilla. In Chrome/Opera the time control is simple, with slots to enter hours and minutes in 12-hour format, and up and down arrows to increment and decrement the currently selected component. An "X" button is provided to clear the control's value. The Edge time control is somewhat more elaborate, opening up hour, minute, and AM\PM pickers with sliding reels, as well as "OK" and "Cancel" buttons, denoted by a Checkmark, and "X", respectively. Firefox's time control is very similar to Chrome's, except that it doesn't have the up and down arrows. 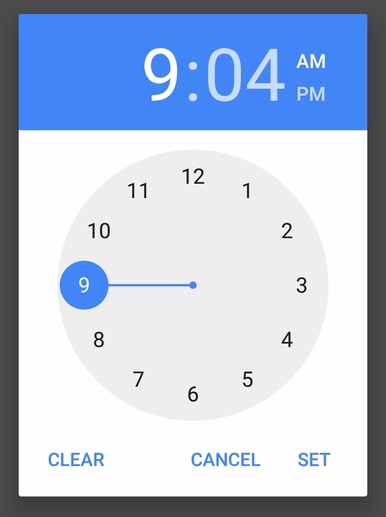 The TimePicker control in Chrome for Android displays a full clock, with hands for both Minutes and Seconds, and an AM\PM toggle. It also has "Clear", "Set" and "Cancel" commands. Awesome!! Thanks a lot TaterJuice! Awesome, that would be great for debugging! 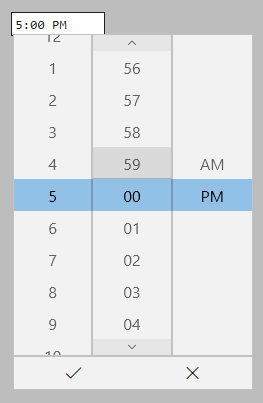 Right now, I have to use browser-developer tools and MessageBox.Show(msg) to step through the datepicker and timepicker code in browser, because I can't test it in the simulator. Does the simulator use IE11 shell, or a proprietary wrapper of some kind? If it uses the IE11\Explorer shell, you may be able to migrate to the EDGE shell. Either way, thanks for the feedback! I'm looking forward to continuing work on libraries for CSHTML5.